The last time the Bachchans visited the city was a decade ago. 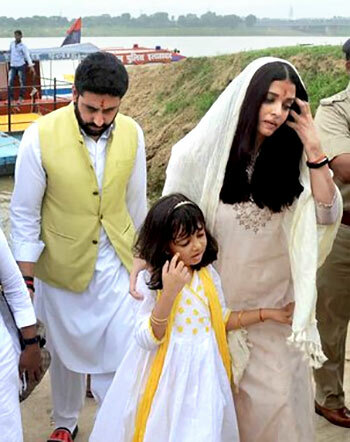 Aishwarya Rai visited Allahabad along with husband Abhishek Bachchan to immerse the ashes of her father at the Sangam, the holy confluence of Ganga, Yamuna and mythical river Saraswati. The couple was accompanied by their six-year-old daughter Aaradhya, Aishwarya's mother Vrindya Rai and brother Aditya Rai. Upon their arrival at the Sangam, the group was received by some policemen and priests, who escorted them on to a boat. After reaching midstream, the ashes of Aishwarya's father Krishnaraj Rai, who passed away in March, were immersed amid chants of hymns. "It was a personal visit by the Bachchans, who had requested for privacy and hence only bare minimum deployment of police personnel was made. They left immediately after performing the rites at the Sangam," District Magistrate Sanjay Kumar said. Incidentally, the last time the Bachchans visited the city was a decade ago when they accompanied Abhishek's father Amitabh Bachchan to immerse the ashes of the latter's mother Teji Bachchan. The Bachchans have their roots in the city where Teji got married to renowned Hindi poet Harivansh Rai Bachchan. Amitabh spent his early childhood there before the family moved to Delhi in the 1950s.